View of the village of Shepperton in Surrey taken from the Oatlands side of the river. In the village, there is St Nicholas's Church, the tower of which dates from 1710 and the rest of the church dates from 1614. 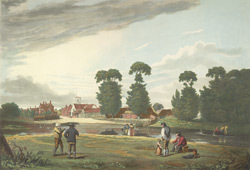 The village was situated on the banks of the River Thames and the main occupation of its inhabitants was agriculture. There are a number of extremely old cottages in the village, as well as an old Rectory, dating back to the 15th century.